Welcome to our PSPA dance family. Please fill out the following information completely. If you have any questions, please do not hesitate to ask. There is a $25.00 per year per family non-refundable registration fee. This fee is for all classes from July 1, 2018 thru June 30, 2019. For proper class placement, please review available options with our staff prior to enrolling in a specific class. Please consult with our office prior to enrolling in class to ensure proper placement. EXCEPTION: Preschool (3-4) Combination, Pre-K (4-5) Combination Beginner, and "Little Feet" students may select any class in that category. Please note that if you enroll in multiple classes, the tuition shown will not reflect the reduced rates that will be applied by PSPA. Once the office reviews your specific class enrollment, the appropriate fees with be adjusted and posted to your account. I understand there is a $25.00 non-refundable registration fee per year, per family. This will cover all classes for each immediate family member from day after our June performance thru following year June performance (dates vary slightly). Registration is not complete until this fee is received by the office. We accept online payments of credit cards or electronic checks, check by mail, cash, check, or credit card by the office. I understand class tuition for regular school year classes is due on the first calendar day of each month (not the first class of the month), September thru June. Tuitions are non-refundable. Tuition for Summer programs is due 30 days prior to first class, or at time of registration (whichever is later). Students may withdraw at any time during the year (with notification) and not be liable for the remainder of the school year tuition. Account must be current thru date of withdrawal. Tuitions paid after the 15th day of the month will incur a $15.00 late fee. Returned checks will incur a $30.00 fee. Each class requires a specific leotard, tights, footwear, and hair pulled up. You will be notified of the specific dance wear for classes you are registered for prior to September 1st (for fall classes) / following registration (for summer programs) . Class costumes are required for the June performance. These must be paid for in full by December 15th so they can be ordered to arrive in time for picture day and show. Costumes will be delivered to the student once June tuition is paid. 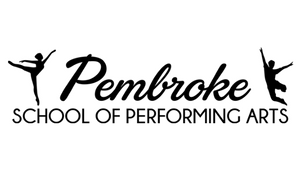 I understand that the name Pembroke School of Performing Arts and its logo, likenesses, and intellectual property are property of Kathleen Kelble, Director, and officers and may not be used in any way or means, including print, internet, or any other public form of media, without express written consent. All choreography and original music/arrangements remain the creative property of Pembroke School of Performing Arts and cannot be used, altered, copied, modified, or published in any way without written consent from Director as well as choreographer/writer. This includes but is not limited to posting videos. I grant Pembroke School of Performing Arts the right to use photos/videos taken in the course of classes and performances for marketing and publicity purposes. I understand that by enrolling my child/ward in this program as a student, I hereby do release and not hold liable Pembroke School of Performing Arts or any of its employees, instructors, agents, and officers from any claims, demands, liability, harm, injury, or damages which may result to the student while in attendance in this school and all activities contained herewith. As parent/guardian, I also certify that the student/students registered have undergone a complete physical examination within the past six months and is not suffering from any mental or physical condition or disease which might increase the risk of injury to them or others while participating in school activities. I further agree I have or will obtain accident insurance for this child. Participation in our June performance is optional. However, we expect every student will perform in the June performance(s) unless office is notified in writing by January 1, as it will impact upcoming choreography for the class. a. Sr Company Students will perform in all shows (Fri, Sat, Sun). b. Jr Company MAY perform in all shows (Fri, Sat, Sun). c. General Division Students will perform in EITHER the Saturday OR Sunday show. Please note that when you choose your class day and time, it will be associated with one of these shows--if you have siblings, cousins, etc. who you would like in the same performance, please make sure you enroll in classes accordingly. We reserve the right to combine Saturday and Sunday shows into a single show if it allows us to meet reasonable show length and seating capacity. This decision will be made no later than March of the school year. a. Our schedule depends on the approval for use of theatre, which we typically receive no earlier than mid-March. You will be notified of final dates as soon as we receive approval. c. Classes for show week will be at a different day and time than your normal class and will be conducted at the theatre. The specific schedule will be published during the spring. d. Intermediate and advanced students' schedules may change two weeks preceding show week to accommodate appropriate rehearsals for June shows.